Thawi Watthana Museum, a community museum, preserves the history, way of life, customs and festivals of Thawi Watthana, a district in the north-western corner of metropolitan Bangkok. 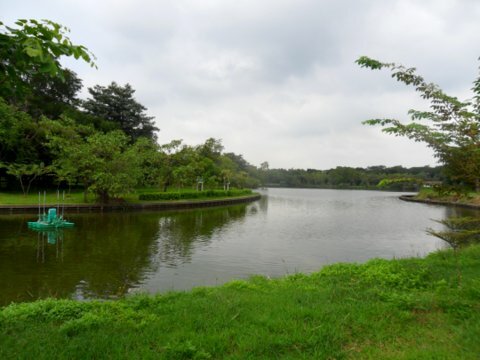 The area covers 5 hectares (12.5 acres) of flat low-lying land watered by 26 man-made and natural canals providing fertile soil that can be cultivated all year round. The beautiful Utthayan Road passes through Thawi Watthana leading on to the majestic Phutthamonton statue in neighbouring Nakhon Pathom. Let’s explore some of the interesting aspects of this district as preserved in the Thawi Watthana Museum.It's an area that has a pleasant atmosphere and not congested like many other parts of Bangkok. Thawi Watthana got its name from the canal that passes through the district. The canal was dug in 1878 in the reign of King Rama V who named the canal Thawi Watthana which means "increased development". Since 1933 Thawi Watthana was a sub-district (tambon) in Taling Chan district (amphoe) in Thonburi province. When Thonburi province merged with metropolitan Bangkok in 1972, Thawi Watthana retained its status as a sub-district (kwang) in Taling Chan district (khed). It was only in 1997 that the Ministry of Interior announced a change of status and on 6 March 1998 Thawi Watthana became a district (khed) in Bangkok with two sub-districts (kwang), Thawi Watthana and Thammasop. Please see map of Thawi Watthana district. The Thawi Watthana Museum records one event that would have a far-reaching impact on old Siam in the late 19th and early 20th centuries. 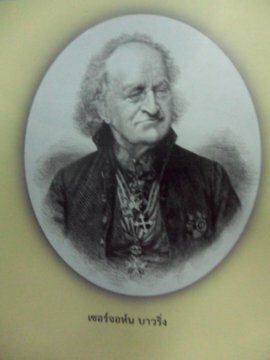 On 18 April 1855, Sir John Bowring the Governor of Hong Kong and Britain’s envoy signed a treaty with King Rama IV that gave British merchants the right to trade freely in Siam. 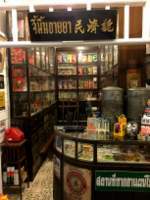 Hitherto, trade in old Siam was a royal monopoly and only those granted a royal concession were allowed to trade. Besides free trade the Bowring Treaty as it was called, removed numerous taxes and set a single duty on import and exports. The British were allowed to own land and lastly had extraterritorial rights which meant they were not subject to Siamese law but their own consular law. Though the terms of this treaty were unfavourable to Siam, one important benefit was that Siamese rice could now be exported to the British territories. This meant an increase in the demand for rice and the demand for arable land to cultivate rice. How was this demand to be met? In 1860, five years after the Bowring Treaty was signed, King Rama IV ordered the digging of the Mahasawat Canal linking the Bangkok Noi Canal in the east to the Nakhon Chaisri River to the west. The task was undertaken by Chinese labourers who dug a canal 27.3 km in length. It facilitated water-born transport for travel between Bangkok and Pathom Chedi in Nakhon Pathom. Royal visits to Pathom Chedi in Nakhon Pathom by the canal were more convenient than the overland route. Farm produce could also be brought to Bangkok via the canal. 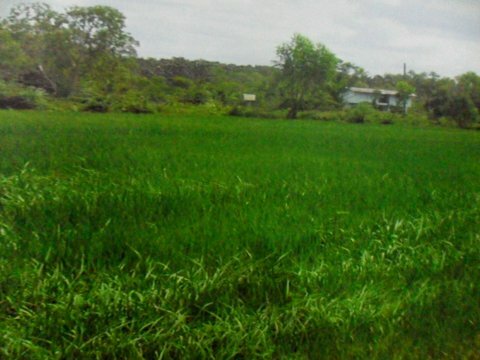 It provided a source of irrigation that would increase the arable land and also the number of rice crops that can be planted in these rice fields*. The surrounding land soon became a huge rice cultivation area. *Note: Traditionally farmers wait for the rainy season from July – September to flood their fields before planting can take place. This method only gives one crop per year. The rice planting cycle for different species is from four to six months. 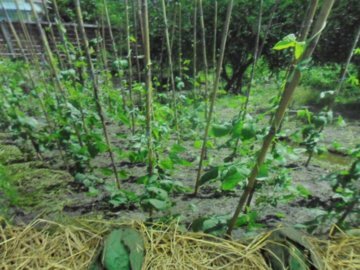 With irrigation, two to three crops can be achieved in a year. A special feature of the Mahasawat Canal was the sala or pavilions that were built on the banks at intervals of four kilometres. 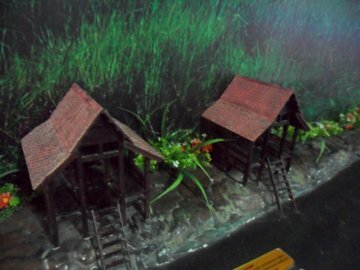 There were a total of seven of these pavilions along the entire length of the Mahasawat Canal. These sala served different purposes; some were for rest, one served as a first aid station. Each of these sala was given a name according to their use. The sala for first aid was called "sala ya" (medicine). There was also a sala at the half way point along the canal called "sala klang" (central) located near Wat Puranawas. There was a set of twin pavilions in particular for placing the dead bodies of those who died digging the canal. It was called "sala sop" or pavilion for the dead. The name was later changed to the more pleasant sounding "thammasop". Sala Thammasop was located between Sala Thammasop railway station and the Klong Mahasawat School. 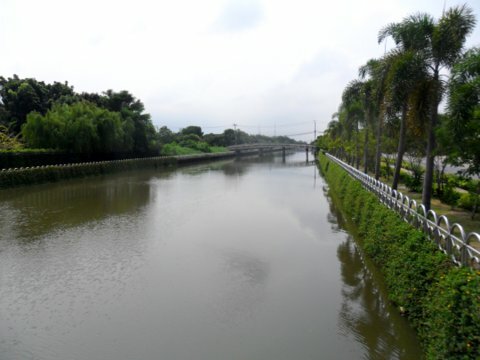 In 1878 during the reign of King Rama V (1868 – 1910), another canal was dug in the area. 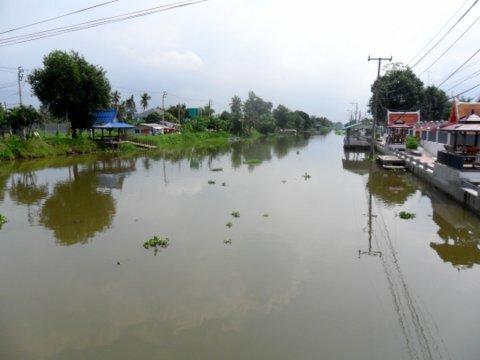 This canal linked the Phasi Charoen Canal in the south to the Mahasawat Canal in the north and was named Thawi Watthana (increased development) by King Rama V.
The area around the canal was called Thawi Watthana as well. 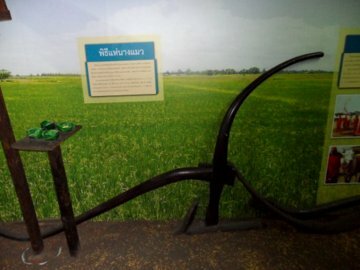 The agricultural displays in the Thawi Watthana Museum clearly show the impact these two canals had on the surrounding area. With a constant source of water, rice farmers could plant and harvest two – three crops a year. Rice fields were in abundance. 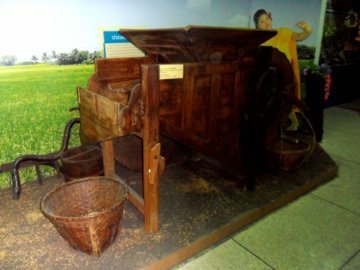 In the past, traditional ploughs and water buffalos were used to plough the fields before planting the seedlings. When the rice sprouts are a month old, they are transplanted. 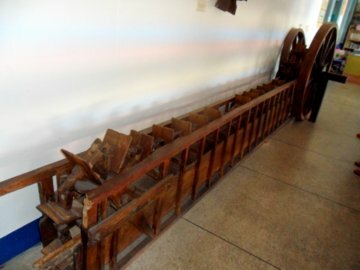 Wooden conveyor belts with buckets are used to bring water from the canal to water the fields. During harvest time, neighbours help each other to harvest the rice which is then threshed to separate the grains from the stalks. The grains are dried and then placed in this machine to remove the husks. 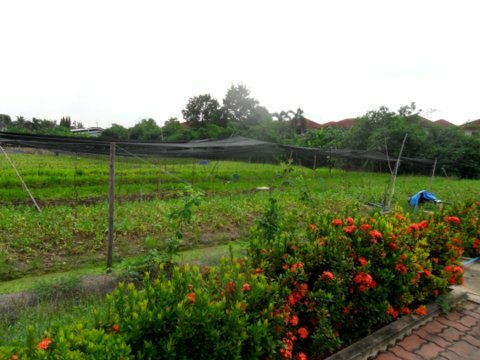 Vegetable gardens and fruit orchards in Thawi Watthana thrived in the fertile soil and steady supply of water from the canals. 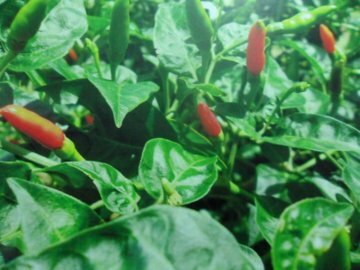 This made the district an important source of fresh vegetables for Bangkok all year round. 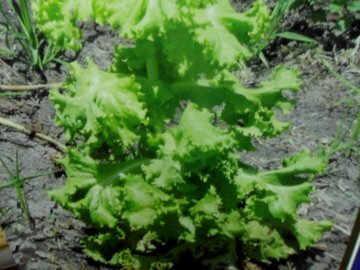 Various vegetables like morning glory, Chinese cabbage are planted by rotation according to the season. 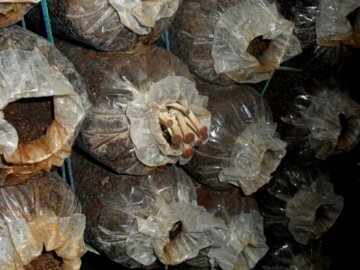 This rotation is necessary to preserve the fertility of the soil. Most of the vegetable farmers are of Chinese descent and farming has been passed from generation to generations. Even beautiful orchids farms prospered from the fertile soil and the steady supply of water. 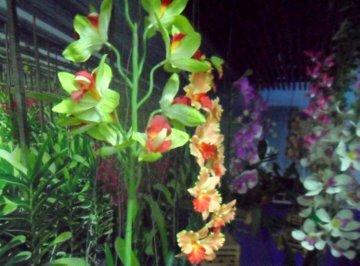 Orchid farming started in the area in 1967 influenced by orchid farms in neighbouring districts of Nong Khaem and Bang Khe. 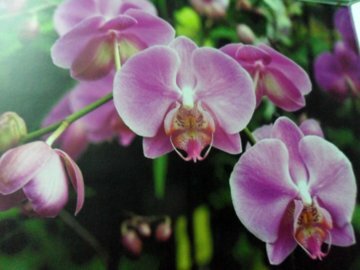 At the peak, there was 1,200 rai (192 hectares or 480 acres) orchid gardens in Thawi Watthana farmed by more 100 farmers. Another product of Thawi Watthana is lotus flowers that are grown in ponds. 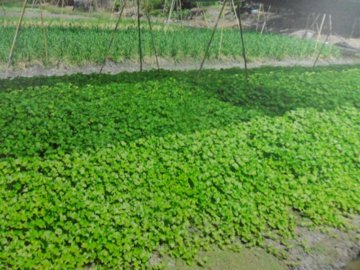 This cultivation started on the banks of the Mahasawat Canal. In 1903 the construction of the railway to the south passed through this area running parallel to the canal. The raised railway track resulted in a depression on both sides which was quickly converted to ponds for lotus flowers. These flowers could be planted all year round and are used during religious ceremonies. They served as an additional source to the farmers and soon became popular all over the district. The railway also made it easier to get the flowers to the market. 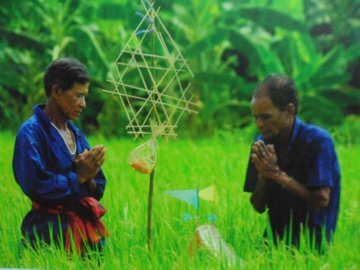 As an agricultural community the farmers in Thawi Watthana have their customary rituals to pray for rain and good harvests. 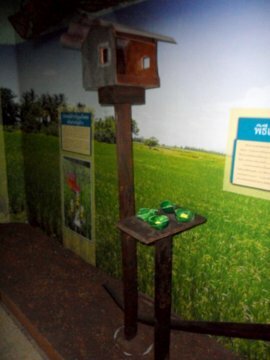 Some of these customs are preserved in the Thawi Watthana Museum. Farmers believe that the rice seedlings have a rice spirit, kwan khao or mae pho sop, a female spirit. This ceremony usually undertaken by women, is performed to pray to the rice spirit to protect the crops and grant a bountiful harvest. Various fruits like oranges, pomelos, sugar cane and bananas are placed in krathong, (little containers made from banana leaf) and left at the dyke that waters the rice field. This ceremony is performed to bring rain to the rice fields. As cats dislike water farmers believe that when cats start to howl, it’s a sign of rain. So water is sprinkled on the cat to cause it to make noise and bring on the rain within the week. The procession consists of 50 – 60 people with the most senior member of the community conducting the ceremony. He calls to the cat to bring rain as he sprinkles water on the cat. The people will dance and sing as they go from house to house for residents to sprinkle water on the cat. This is a ceremony to present new robes to monks at the end of the Buddhist Lent in October. In Thawi Watthana as in Lat Krabang, the ceremony is conducted in boats. After the religious ceremonies there will be the traditional boats races. A custom that’s special to Thawi Watthana is the Krayasart Beggar Play during the harvest festival (sart). It’s played after the usual merit making and thanksgiving at official ceremonies. People will dress up as beggars and row their boats from house to house singing songs and begging for alms. There’ll be lots of merry making and fun as residents join in the songs. 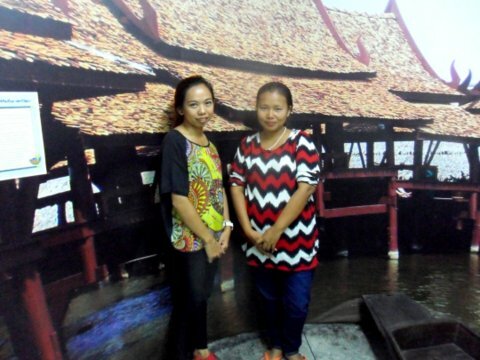 We now come to two stunning attractions in Thawi Watthana. 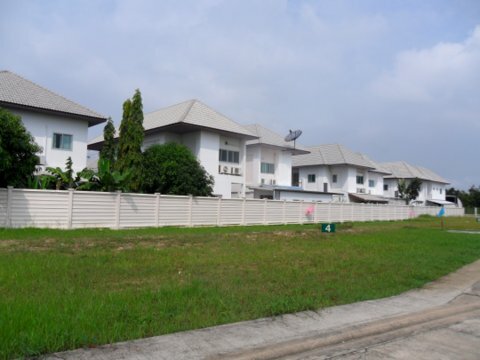 The first is a 3.8 m avenue running from east to west linking Phutthamonthon Road 3 and 4. This 90 m wide avenue with three traffic lanes on either side is the most beautiful road in Bangkok or for that matter Thailand. There are pedestrian and cycling lanes on both sides of the road, concealed electrical power lines, fountains and a lotus pond that runs down the centre of the road. The project was started in 1955 but completion and opening was delayed till 1999. It was worth the wait. 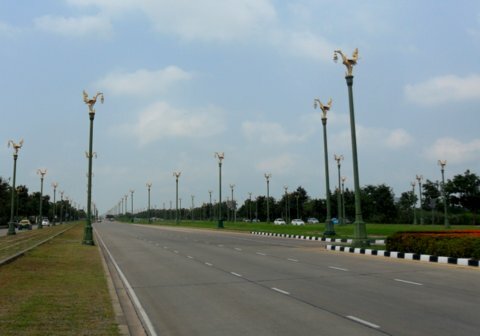 The road is lined with 979 lamp posts topped with the "hong" or the golden swan the steed of the Hindu God Brahma. 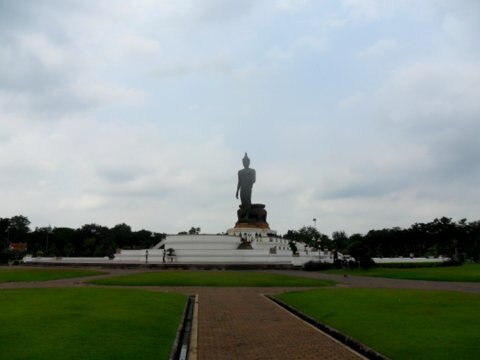 Originally called Aksa Road derived from the English word "axis", as it runs straight into the centre of a huge square area where the majestic Phutthamonthon statue of Buddha is located. The road was later re-named Utthayan Road. Utthayan Road leads straight to a 2 km square religious park with an area of 400 hectares (1,000 acres) which has a 15.8 m statue of a standing Buddha in the centre. The statue is called Phutthamonthon. This religious park is actually in Nakhon Pathom province that’s bordering Thawi Watthana district. Big crowds will gather here during religious days to worship in the park. As I was leaving the Thawi Watthana Museum, I noticed a cultivated plot of land on the way out. It turned out to be the school’s farming plot. 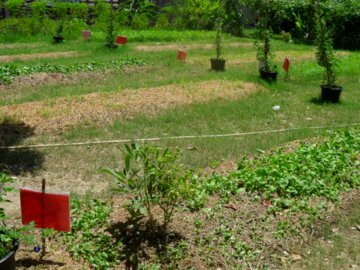 Students are assigned small plots of land where they plant various vegetables under the guidance of their teachers. The same group of students are responsible for maintaining these crops till they are ripe for harvest. They even have a couple of huts where different types of mushrooms are grown and ponds for rearing catfish. All the sala or pavilions are gone, removed as a result of widening the Mahasawat canal in 1947. At the end of 2011 and early 2012, there were severe floods in many parts of Thailand. Thawi Watthana was inundated and many of the farms and rice fields were destroyed. The orchid gardens in particular never recovered as the re-investment costs were high. 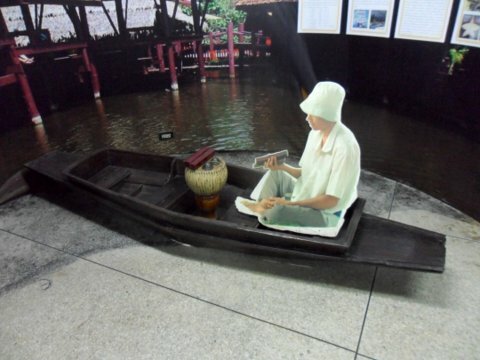 Many of the exhibits in the museum were damaged as the Thawi Watthana Museum was under almost a metre of water! Signs of the damage are still visible and not all the damaged exhibits have been replaced. 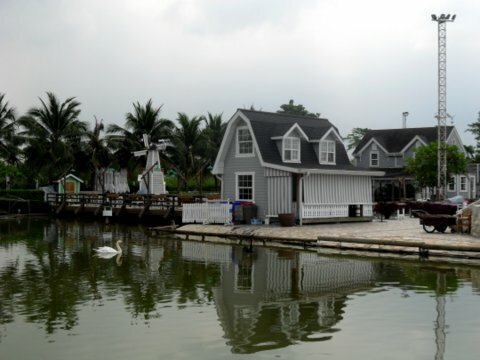 The area on the northern edge of Mahidol University in neighbouring Nakhon Pathom, is a thriving suburb called "Salaya" named after the pavilion that was a first aid station for the men who dug the Mahasawat Canal. The road running along the Mahasawat Canal is named "Sala Thammasop" after the pavilion for the men who died digging the canal. The scenery along the two canals Mahasawat and Thawi Watthana is considerably different today. Only a few vegetable and orchid farms and fruits orchards are left, there are hardly any rice fields. Others have converted to gardens selling plants and trees. One very noticeable development is the presence of new housing in the area. Land is parceled off and sold to owners to construct their own houses. Restaurants and shops have opened in anticipation of the new demand. Within a century, Thawi Watthana has been transformed from an agricultural area to an up-market residential suburb. The golden swans, fountains and lotus ponds along Utthayan Road are as beautiful as ever, as we made our way down the road to Phutthamonthon. 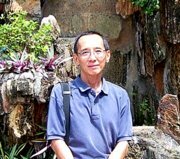 I wish to express my sincere appreciation to the two administrators of the Thawi Watthana Museum, Kwang and Sir. They were extremely helpful, knowledgeable and enthusiastic during the conducted tour of the museum. Once again thank you very much for the information in the booklet and brochures you have given to me. 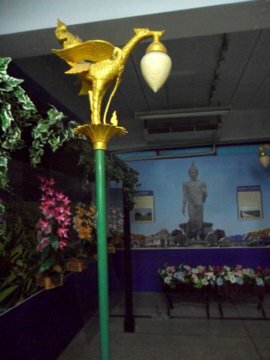 The Thawi Watthana Museum is located in the premises of the Wat Puranawas Primary School. Air-conditioned bus service no. 515 from the Victory Monument goes all the way to the Salaya Market. From there take a taxi or motor-cycle taxi to Wat Puranawas School. From Bangkok cross the Chao Phraya at the Krung Thon Bridge or the Phrapinklao Bridge at get on to Boromrajajonani Road. Proceed all the way to Phutthamonthon Road 4, turn right onto this road. Proceed on to Salaya, make a U-turn at the clock tower then turn left into Thammasop Road.